Absolute Agility - Train with a Champion! 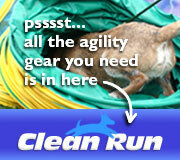 Classes are offered for all levels of Dogs in Agility, Pre-Agility, Obedience and Family Pet. Private Lessons, Group lessons and Consultations will begin in April. Open Practice sessions will be starting in June for week day evenings. Instruction would also be available during these times, if requested. AARF is now a COOL RUNNERS distributor! Check the link below and start your wish list today! Email to see how this can benefit YOU!! !